Like fighters? 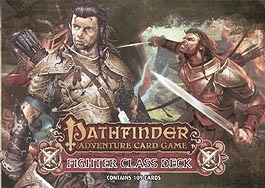 You'll love the Pathfinder Adventure Card Game Fighter Deck. Explore four different Fighter archetypes in this 109-card set, from magic-dabbling Flenta to fun-loving Valeros. The Fighter Deck boasts new weapons, allies, and other cards to take your character all the way through any Pathfinder Adventure Card Game Base Set, or Pathfinder Society Adventure Guild Organized play campaign. Fight on!